This is a picture of Findochty Harbour situated on the Northern Coast of Scotland. 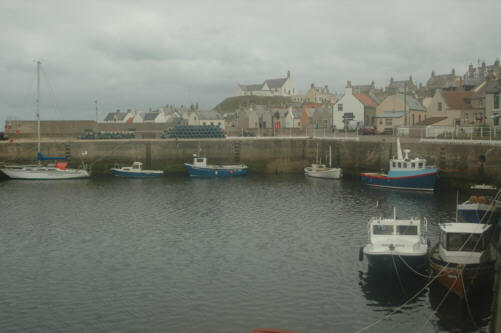 Findochty is one of many harbours located on the North East Coast of Scotland. The village, even from its early days crowded around the natural harbour known as Crooked Haven. It expanded as a fishing port through the 1700s and 1800s, and by 1850 was home to 140 fishing boats. However, expansion in the late 1800s of nearby Buckie (which provided a better harbour) resulted in the fishing fleet leaving Findochty by 1890.